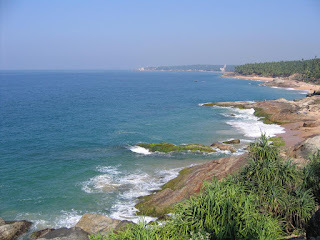 Vizhinjam is a small coastal town in Thiruvananthapuram district of Kerala. Why Vizhinjam port is so important is that it fullfill the above conitions, that too with minimal maintenence coast. The advantages of the site is the availability of 20m contour with in a nautical mile of the coast; Proximity to international shipping routes due to its unique positionIt requires a diversion of just 20 nautical miles, and will become a good stopover for vessels before proceeding to Suez; Minimal littoral drift along the coast so low maintenence and dredging coast ;Close to international airport and rail road networks etc. country will handle 15.64 million TEUs. Not only this, in total Indian ports doesnt have the capability to handle huge motherships. Now we are depanded on Singapore, Salala, Colombo ports for transshipment. A port which have so much economical advantage and critical importance faced so much delays may be unbeliveble, but its the truth. Vizhinjam was declared as a port in 1977, opened for cargo only in 1991, but to be declared as a customs port it waited upto July 1992; The history of the plan to develop the port is much more sad story. Memorandum of understanding to develop the port as trans-shipment port was signed in1995. But its is yet to realise!!! The bid to build port facilities was won by Chinese firms, which was rejected by Union shipping ministry citing security resons. But the ruling allience led by CPI(M) wasted time by fighting against the decision. Legal battle followed with Mumbai based Zoom developers, and in the end the Hyderabad based firm Lanco Kondapalli which won the bid told to the ministry that it is withdrawing from the project because of the possible delays and legal issues. On july 25, 2009 Kerala Law and ports minister asked the union government to take 4,500 crore project as it had the potential to earn over 1000 crore rupees of foreign exchange after commissioning. I dont think people expect the government to execute the projects in lightning speed. Nor they expect the efficiency of Chinese government in finishing dream projects. But I think people of India have the right to see the completion of projects in sheduled time. This will be the one of dream projects in Kerala atleast for the nect 3-5 decades if realised. It will rewrite India's shipping history and we will no longer depanded on other nations for trans-shipment. But the million dollor question is will the governments allow it to develop? According to the latest reports Kerala Government is again trying to move ahead with the project. This time how far they will go?